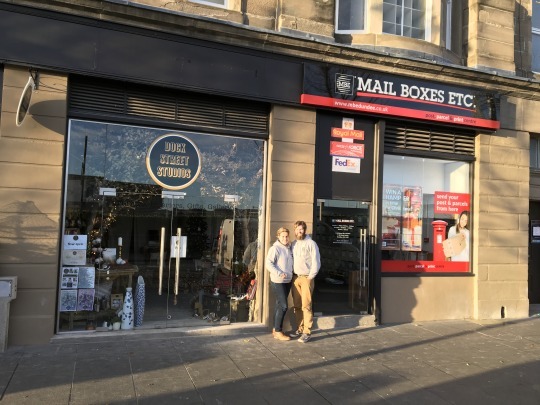 Enterprising Dundee businessman Grant Campbell has relocated his thriving Mail Boxes Etc. business to 10 Dock Street, Dundee – part of the iconic new £1 billion Dundee Waterfront regeneration project. The new store, which opened on 2 October, is just a stone’s throw from the exciting new V&A Museum of Design Dundee, and right at the heart of the Waterfront area with its new marina, port developments, offices, hotels, bars, shops, cafes and residential accommodation. Grant has been offering post, parcel and print services to the local community from his current store at 17 Union Street since 2006, and the store itself has been established some 17 years. Business continuity will not be affected by the change, however, and customers will be pleased to know that the new store is just around the corner from the old one. “I couldn’t pass up the opportunity to be part of the new Waterfront development,” said Grant. “With 7,000 new jobs being created, and so many business opportunities, as well as an influx of tourists and private residents, Dundee Waterfront is the place to be. While MBE stores serve all sectors of the community, the new store’s proximity to the V&A Museum of Design Dundee is apt. Not only does Grant specialise in pack and ship services for art, antiques and items bought at local auction houses, but his wife, Sara, has opened an art and furniture gallery next door to his new store. Dock Street Studios will exhibit locally established crafters and emerging artisans to showcase their works to a new audience. Grant and Sara have worked together in the MBE Dundee store for ten years but are now going to be neighbours for the first time.